Why Should I Shred My Paper Documents? Does your business or organisation use paper on a daily basis? Does this paper contain data of personal details? These are simple questions but if answered yes then you are required by law (both Irish and EU law) to ensure that your sensitive data is destroyed correctly. If a data breach occurs, it will be your business or organisation that suffers with a hefty penalty or fine for the breach. Your current shredding company may not be liable for the breach. Ultimately it comes down to you to protect your data. More than just a fine but the representation loss from a data breach can result in a severe loss of business if customers have no confidence with how their details are maintained in a secure manner. How Do I Choose a Confidential Paper Shredding Company? Any reputable shredding company will comply with Irish and EU data protection laws. Choose a shredding company that has Din 66399 Standard which is an EU directive and is used by Security in Shredding trucks when on site shredding paper documents. A confidential shredding company that provides a Din level 6 shred, will destroy documents beyond recognition. Avoid using generic office shredders as they do NOT provide adequate data destruction. The paper shredded can be restored which is a huge data breach risk if continued. When choosing your paper shredding company you have options to what service you desire. At Security in shredding we offer On Site Shredding in your premises. With this service we can provide lockable bins and our trained staff will handle and destroy your paper documents on site with our specialised truck. This service can be done on a scheduled basis or an on call basis. We also provide clear out shredding (purge clear out) for large scale document shredding to remove clutter or unwanted documents from your office. If On Site shredding does not appeal or work for you then Off Site Shredding services are also available. This consists of bag collection service. Your paper to be shredded will be stored in lockable sealed bags which are provided by us. Collected by our trained staff and put into our secure vans and shredded at our location. Once shredding has being completed, we provide you with a certificate of completion ensuring the paper shredding process has being completed. Giving you piece of mind that your paper documents were destroyed confidentially. For any and all your confidential shredding needs in the Limerick and Galway areas. Security In shredding offers a top quality and secure service. We comply by the Irish and EU laws and practices, to ensure that your data is protected when paper is being shredded. 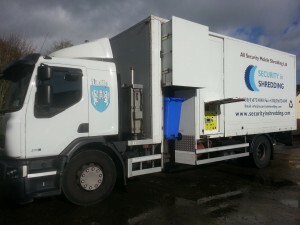 This entry was posted in Confidential Shredding, Off Site Shredding, Onsite Shredding, Paper Shredding and tagged Compliance, Confidential Shredding, Data Security, Onsite Shredding, paper shredding Galway, paper shredding limerick, Secure Shredding, shredding Galway, shredding Limerick by Security in Shredding. Bookmark the permalink.